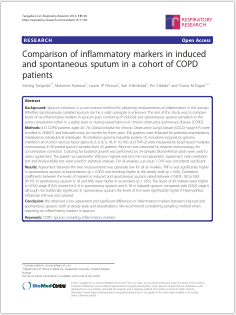 Comparison of inflammatory markers in induced and spontaneous sputum in a cohort of COPD patients. Tangedal S, Aanerud M, Persson LJ, Brokstad KA, Bakke PS, Eagan TM. Respir Res. 2014 Nov 15;15:138. doi: 10.1186/s12931-014-0138-6. 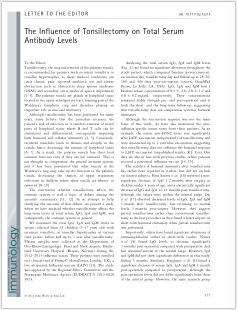 The influence of tonsillectomy on total serum antibody levels. Pidelaserra Martí G, Isdahl Mohn KG, Cox RJ, Brokstad KA. Scand J Immunol. 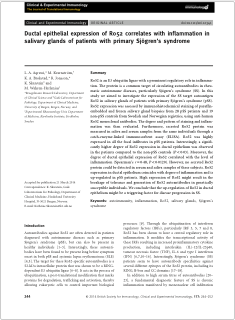 2014 Nov;80(5):377-9. doi: 10.1111/sji.12213. 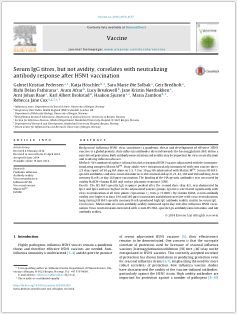 Serum IgG titres, but not avidity, correlates with neutralizing antibody response after H5N1 vaccination. Pedersen GK, Höschler K, Øie Solbak SM, Bredholt G, Pathirana RD, Afsar A, Breakwell L, Nøstbakken JK, Raae AJ, Brokstad KA, Sjursen H, Zambon M, Cox RJ. Vaccine. 2014 Jul 31;32(35):4550-7. doi: 10.1016/j.vaccine.2014.06.009. Epub 2014 Jun 18. 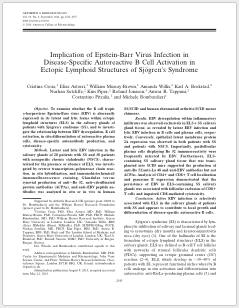 Implication of Epstein-Barr virus infection in disease-specific autoreactive B cell activation in ectopic lymphoid structures of Sjögren's syndrome. Croia C, Astorri E, Murray-Brown W, Willis A, Brokstad KA, Sutcliffe N, Piper K, Jonsson R, Tappuni AR, Pitzalis C, Bombardieri M.
Arthritis Rheumatol. 2014 Sep;66(9):2545-57. doi: 10.1002/art.38726. Ductal epithelial expression of Ro52 correlates with inflammation in salivary glands of patients with primary Sjögren's syndrome. Aqrawi LA, Kvarnström M, Brokstad KA, Jonsson R, Skarstein K, Wahren-Herlenius M.
Clin Exp Immunol. 2014 Jul;177(1):244-52. doi: 10.1111/cei.12341.